The fourth "Young Sherlock Holmes" adventure from Andrew Lane, Fire Storm, was first relased in the UK in 2011. 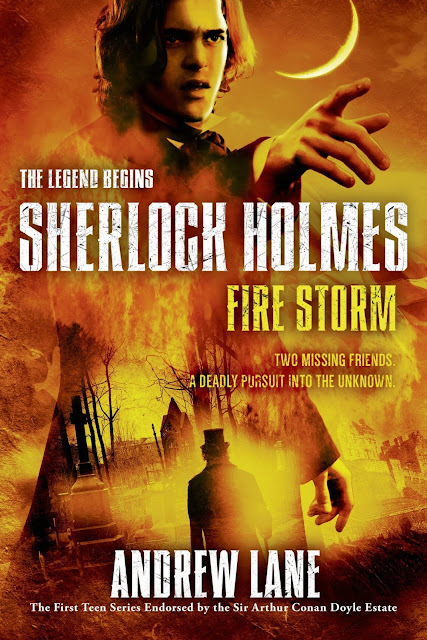 This 2014 U.S. paperback rebrands the series as "Sherlock Holmes: The Legend Begins." Teenage Sherlock's captivating sidekick Virginia and her father have vanished. Their house looks as if nobody has ever lived in it; the neighbors claim never to have heard of them. Sherlock begins to doubt his sanity, until a clever clue points him to Scotland. Following that clue leads him into a mystery that involves kidnapping, body-snatchers, and a man who claims he can raise the dead. Only the budding detective Sherlock can untangle the dangerous web that traps his friends. THINK YOU KNOW SHERLOCK HOLMES? THINK AGAIN!